Home » Eye Glasses & Contacts » Contact Lenses » Contact Lens Overuse – Don’t abuse your contacts & avoid the eye health risk! Contact Lens Overuse – Don’t abuse your contacts & avoid the eye health risk! Many contact lens wearers have become accustomed to bad contact lens habits. The same can be said by eyewear as well, however, contact lenses can lead to an eye infection when poorly maintained or mishandled. Below, we've listed a couple of brief tips regarding maintaining contact lenses, and how to ensure that your eyes remain safe and comfortable for optimal health. Never rinse your contact lenses with tap water! Oddly enough, a number of people share with their eye doctor that they wash their contact lenses with tap water. Water not only fails to clean your contact lenses but will increase the likelihood of bacteria build-up. Bacteria on contact lenses will likely lead to red eyes, irritation, and possibly an eye infection. Always wash your contact lenses with contact lens solution that's recommended by your optometrist. Say GOODBYE to that old contact lens case! Contact lens cases are reusable - temporarily. They have a lifespan of maybe one or two months. Bacteria build-up affects the contact lens case as well as the contact lenses and will not go away. Simply scrubbing out your contact lens case with soap will not be enough. The plastic material absorbs chemicals and bacteria, so a simple scrubbing will fail to solve the real issue. Fortunately, August Wallace Eyecare Associates provides free contact lens cases to all patients who come through our door. Daily contact lenses are popular, comfortable, and reduce overuse! The standard contact lens worn varies between bi-weekly or monthly lenses, yet daily disposable contact lenses have become the ideal recommendation among many eye doctors. The maintenance-free handling, avoidance of a contact lens case, and strictly encased in contact lens solution avoid bacteria build-up. Plus, they're very easy to keep track of, and losing one isn't nearly as problematic as a monthly. Last Safety Tip: Take a Contact Lens Holiday. Your eyes are not meant to be encased in plastic for the whole week. Make sure you wear each week your backup pair of eyeglasses to help your eyes get the oxygen they need to breathe! If you don't have a backup pair of eyeglasses, you may want to invest in a new pair to help your eyes get back on track with proper contact lens care. 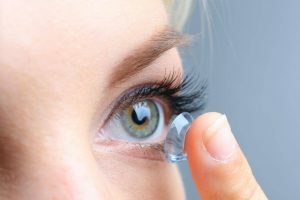 For more information about wearing contact lenses, contact our Longview, TX office at August Wallace Eyecare Associates today.